Mayors Jacob Frey and Melvin Carter at the debate. Photo by Andy Mannix – Star Tribune. 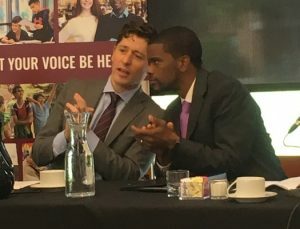 Jacob Frey and Melvin Carter, the new mayors of Minneapolis and St. Paul, served as judges June 7 at the Minnesota Urban Debate League’s Great Education Debate at Augsburg. Augsburg’s urban debate league program provides resources and programming to support competitive academic debate at Twin Cities high schools and middle schools. The goal is to empower students through competitive academic debate to become engaged learners, critical thinkers, and active citizens who are effective advocates for themselves and their communities. At the debate, four students presented arguments on the topic of investing in career technical education as an alternative to four-year college degrees. Both Frey and Carter gave tips and feedback to the participants. “You have mastered a skill that has largely been lost in American society, which is the ability to debate respectfully,” Frey told the students. See full story on the Star Tribune page. Learn more about the Minnesota Urban Debate League here.